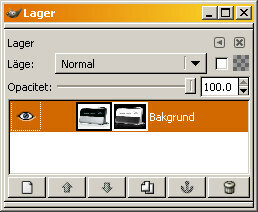 Searchbar autosizer. A great extension which automatically increases the width of the searchbar if you type something too long into it. This should be a default feature of Firefox – it’s very useful, and doesn’t get in the user’s way. AdBlock Plus. Makes the web so much nicer to browse and look at. 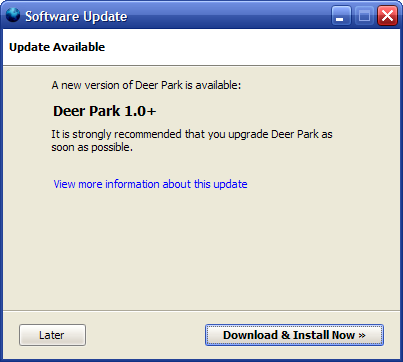 Especially combined with the Adblock Filterset.G Updater. SessionSaver. It’s wonderful to be able to just close your browser and know that everything you’ve got open (including half-finished forum/blog posts) will be there when you fire it back up again (pun intended). Answers. Lets you alt-click any word to instantly look it up on answers.com. 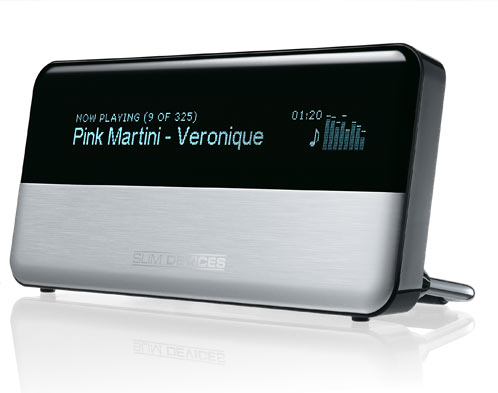 Very nifty and slick. Search Engine Ordering. Allows you to order your search engines as you want them. Very useful – this should also (and will?) be part of basic Firefox functionality. The great thing is that everyones favourite extension list looks different. 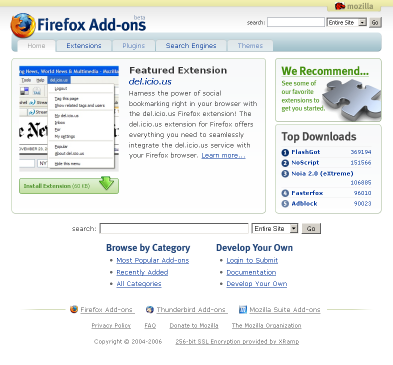 Firefox extension system allows you to add just those cool/useful/slick features you yourself like. Update Channel Selector. Useful when I feel like keeping in touch with the latest Firefox development. Web Developer. Has some very handy funcions when managing and editing your website. Classic Menus. 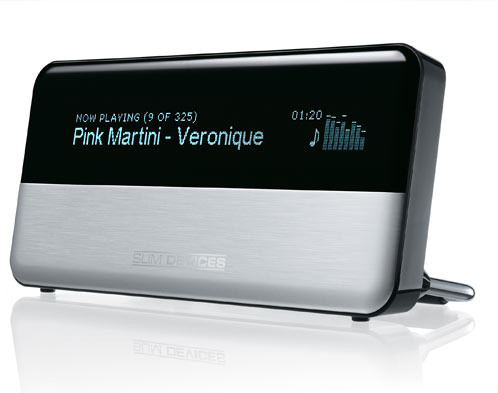 To improve the look of Firefox 1.5 under W2K & co.
FoxyTunes. Control your media player from inside Firefox. Blogger Web Comments. Cool extension by Google which displays links to blog posts talking about the webpage you’re currently looking at. Makes for lots of overtime surfing. ChatZilla IRC client for Firefox. You often hear (as a reason to use Opera instead of Firefox) that Firefox’s extensions will interfere with each other and won’t play nice. All my current extensions work perfectly together. In fact, I can only remember having one slight problem with extensions treading on each others toes since I started using Firefox 1.0 one year ago: The Web Developer and Tab Sidebar extensions use the same keyboard shortcut, Ctrl+Shift+T, which resulted in only one of the extensions responding to it. Posted in browsers, Mozilla Firefox | Comments Off on Firefox 2.0 is going to ROCK! The Microsoft RSS Team has just announced that IE7 will be using Firefox’s feed icon. How many people would have thought that a year back? A week back? It’s really cool that MS are working so cooperatively with their competitiors at the moment. Maybe they have to? Who knows. I only wish they would do something along the same lines with their rendering engine. Either use Gecko (I can always dream, right?) or make Trident as standards compliant as the best (the rest). Edit: Oh, and thanks jer for the nudge! When I’m reading things on the Internet I always come across words that I don’t understand. Wheat I’ve done up until now is to select the word, righ-click and do a web search for that word. That has taken me to google, upon which I’ve clicked [definition] to get me to answers.com. In about:config, filter for search and then simply change the value for browser.search.defaulturl to http://answers.com/ . That’s a huge improvement, at least to me! I don’t seem to be able to use Wikipedia here though, since the search term placeholder %s doesn’t seem to work. Anyone know of a workaround? This sounds really cool. Can’t wait to try it out, or at least to read some real reviews of it. Edit: Added a Firefox 1.5 graphic to the left column. Judging from the ironic tone in this post by Tritan Nitot of Mozilla Europe, Firefox 1.5 will preusumably be released on 29 November. That’s tuesday next week – nice. 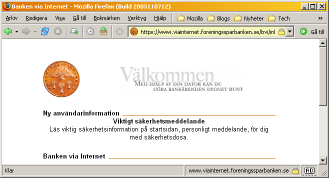 Rob Franco has written about the plans for IE7’s secure/insecure website user interface over at IEBlog. The current suggestion is to have three different background colours for the address bar indicating different statuses for the current website. 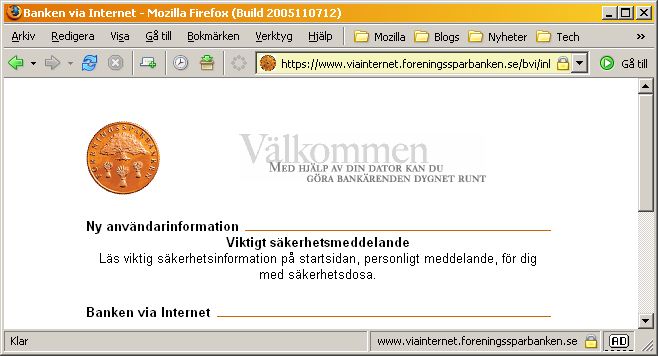 Red – the website is blocked by the phishing filter and an informative message is displayed instead. Yellow – a suspicious website, showing signs of being a phishing scam but not confirmed by the list of known phishing websites. Green – sites that meet future guidelines for better identity validation . If Microsoft were to implement their three colour system it might cause major confusion, at least for the digitally impaired. Microsoft makes their yellow some shade of orange instead to minimize the confusion. The browser UI developers together agree on some standard colour system and apply it in all browsers. 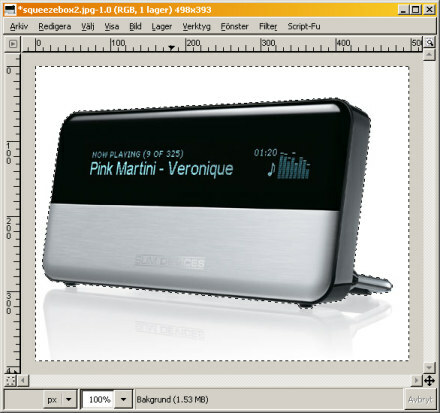 Either the system proposed by Microsoft, or some variation of the system used today in Firefox and Opera. The latter would obviously be better for the user, but the question is – can these big browser players really reach an agreement here? I still can’t quite grasp that they actually sat down together and talked about this, like we were moving towards some kind of… er… I don’t know – Web 2.0? 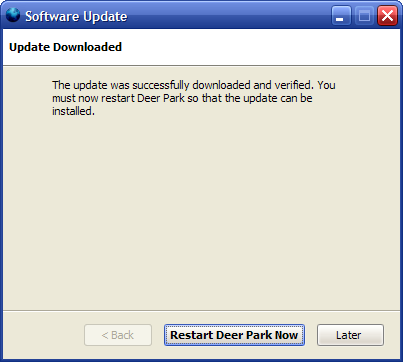 After having tried to install Kubuntu a load of times, I tried one more time. This time I actually got it installed, without the installer hanging and without errors on the DVD+RW. All seemed fine. I was trying to work out how to get Firefox 1.5 RC2 to install, and where to install it. Then all of a sudden it decided that I wasn’t allowed to enter Administrator Mode , which is necessary if you want to make any changes to the system settings. It asked for the password, but ignored it blankly on every try. And rebooting didn’t help either. I have tried reinstalling kcontrol as recommended in this thread at ubuntuforms.org, but to no use. I’ll maybe just wait to the next release and try again then. All this is (sadly) making me realize that even if Windows seems pretty unstable at times, the fact that it at least works most of the time isn’t such a bad thing. Tristan Nitot has an interesting blog post about various factors which could explain the widely differing Firefox percentages throughout Europe. Here’s what CNN Technology looked like on 2004-11-09. Here’s what Google News looked like on 2004-11-10. Here’s what Blake Ross said about Phoenix’s (one of Firefox’s previous names) possibilities of becoming a major piece of software. It’s been great to see how Firefox really has spread throughout the world during it’s first year. For the second year, lets hope Firefox ends up on many many more computers. Maybe with a little help from Google… Can’t wait to see Firefox reach 25%, which I’d say is the next magical number. Feels good to know we’ve got Google on our side anyway. That can’t be a bad thing. Hopefully the many improvements for Firefox 1.5 will make it even more attractive and spreadable. 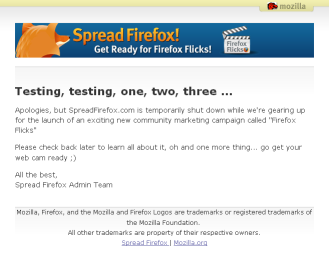 I also can’t wait to see what they’ll conjure up at SpreadFirefox.com for us to do. Hopefully it’ll be something a little more useful than just taking a picture and uploading it… I want to be used! Let us pay for a TV-commercial, or collect money for some really wild and media-attractingly crazy event! The NYT ad was paid for by 10,000 people. SpreadFirefox now has more than 100,000 members. I do hope they don’t let the 1.5 launch just slip by, but I’ve got a hunch they have something up their sleve. Posted in Mozilla Firefox | Comments Off on Happy Birthday Firefox! Haha. This is so funny and, unfortunately for Microsoft, so true. Bug 9101: Break lines at soft hyphens (&shy;) and display hyphens if line broken. Bug 98971: Prettier image resizing & scaling (Bilinear, Bicubic, anything better than Nearest Neighbor). The above two are what I would call the most important Gecko bugs right now. They both do their part for preventing truly scalable website design. For instance, if the latter one was fixed, website designers would be much more inclined to specify image sizes in em units and the images would resize beautifully with the rest of the content. Bug 16380: Need anti-aliasing for -moz-border-radius style property. Bug 75077: Interlaced PNGs should be displayed with bicubic interpolation. 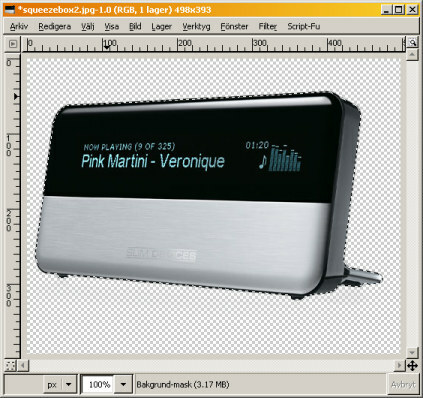 Then of course, there is the Acid 2 bug, which is being worked on as we speak – and may well be fixed for Firefox 2.0. Fini Alring has a great demo of CSS3 columns. It’s making me drool. 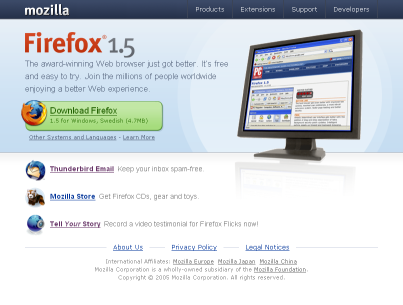 For those who don’t have Firefox 1.5 beta there are screenshots. After having played about with a three-column CSS layout, I decided to use the design for my blog. So, here’s the result! There may be some minor polishing work left to do, but I think I’m mostly done. So, If you’re reading this in Internet Explorer, and wondering what this design really should look like – try Firefox instead. You’d be doing yourself, me, and every single web designer in the whole world a huge favour. I also added a favicon for anyone who may have bookmarked the site. Update: Just for the heck of it I made a semi-transparent white PNG image for the background of links when hovered. 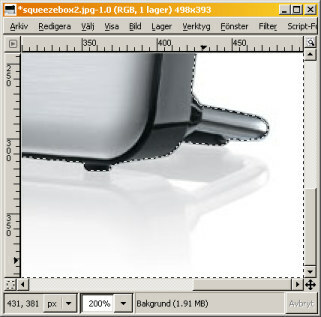 That way I don’t need to find different suitable hover colours for the different background colours. Also, if I want to change the colour-scheme later on it will be much easier. As I was hoping a while back, Opera (the desktop version) has now become real freeware, without ads. This is truly great news for the web. Now, hopefully, the Firefox and Opera communities can work united (sort-of, at least) towards the main target: to bring down the marketshare of that old, stinking, vile pile of a browser known as Internet Explorer. Oh, what does it matter, now that IE7 is just around the corner? Microsoft are working towards standards compliance now. So, if we (i.e. us Firefox and Opera fans) make sure that our favourite browsers always have a healthy market share, of at least 10% each (and hopefully a lot more), I think we can keep this Internet thing moving. If we want to be able to use any CSS3 stuff before we die we had better give it our best try.